Churros are known as the doughnut of SPAIN but they are also popular in places such as Latin America, Portugal and Morocco. They are a fried pastry dough coated with cinnamon and sugar and dunked into warm chocolate. I was living in Spain last year and the Churrerias were one of the best parts. 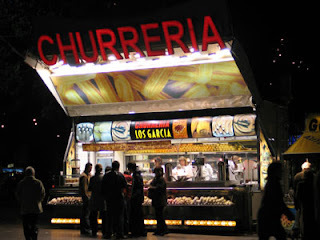 Churrerias were either street vendors or shops that mainly sold churros! In high school I took Spanish and often we would have a class party or days where we would bring in food. Churros were my favourite to make and dish of choice to bring in. They are so simple to make and they are a delicious dessert or even breakfast! There are so many recipes out there, and they are all basically the same. Here is a LINK to a multitude of churros recipes. 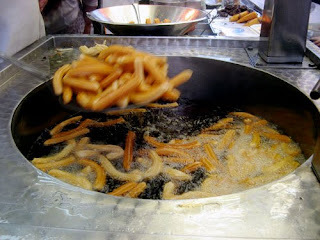 Choose whatever one you like and enjoy your churros! If you don't feel like making a skinny deep fried doughnut, you could always travel to Spain to find one! 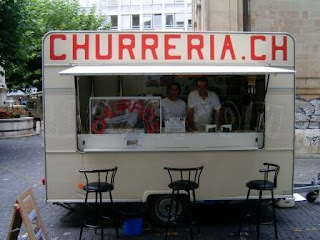 amazing post... i want to make churros now!